Did you know that Italy is full of discos? Did you know that if you go to a disco in Italy you can never enter before 11:00 pm (or, it would be really embarrassing to arrive any earlier), and music and dancing never starts before 12:30 or 1:00 a.m.? BECAUSE after a night awake, after you finish dancing at 4.00 a.m., the most important emotions that rage in Italians minds are: 1) they are a little bit tired 🙂 ; 2) they are starving!!!! and for your “night digestion” (especially after one or two drinks too much). and we love it, because it is really delicious!!! And especially after all the rich festivity meals, why not opt for some food that is more “simple” and “easy” to digest?! Let’s go find out how to make this new spaghetti sauce recipe. You will be pleasantly surprised by the fact that it will be ready in 20 minutes. basil to taste (dried or fresh, but preferably fresh). The preparation of the sauce takes about the time for the pasta to be cooked, so you don’t need to do anything in advance. All the steps will take not more than 20 minutes. Put the water in a big pot at medium heat. While you wait for the water to boil, peel off the garlic’s cloves, cut them in two pieces. When the water starts to boil, toss the spaghetti in the water and set the timer for the pasta, as directed on the box. With the sauce pan at medium heat, add the olive oil, garlic, crushed red pepper, the basil. Let the garlic cook for a while (until it becomes blonde, don’t let it brown!). When the garlic seems golden, add the diced tomatoes and let the sauce cook for a couple minutes more. Since your spaghetti should be ready, drain the pasta very well, mix them with the sauce, and serve it!!! 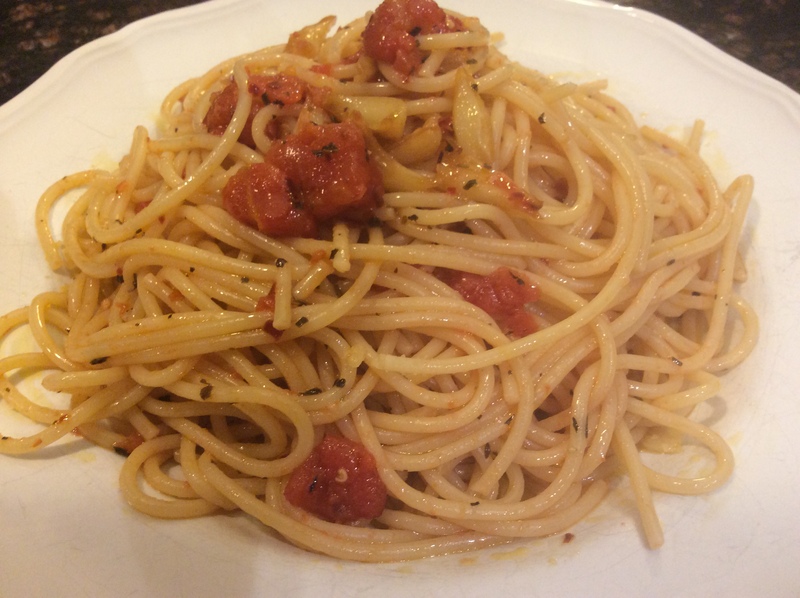 TIPS: – My husband loves garlic, so when I mix the spaghetti to the sauce, I don’t need to take the garlic aside, but if you don’t like eating garlic (but like me, you just like garlic’s flavor), before to mix the spaghetti with the sauce, take the garlic out of the pot: your spaghetti will taste wonderful anyway!!! – I usually cook this pasta when I’m totally out of other ingredients: it is so easy that rarely I don’t have these few ingredients to make it! – If you are on a trip to Italy, and you would like to enjoy a simple dish, you can go to whatever restaurant or “trattoria” you want and just ask for an “Aglio e Olio”, and they will immediately know what are you taking about, because this is exactly the way this sauce is known in Italy. I often made something similar to this. And it’s so handy and delicious. This looks even nicer than the one I make. Yum! Oh!! how wonderful this dish is, and so glad to see that some else makes it. We make this all the time, as like you we grew up with it. The more garlic, the better for me!! Thanks!! FB Shared for sure. I am curious! Are you Italian as well, or does this dish is popular even in some other countries? I never knew what to do with that garlic sprout before. Thank you! Hi Rebecca! It was my mom that taught me to take the sprouts away to avoid a bitter taste. Consider that if your garlic is very fresh, it shouldn’t have the sprout at all… but usually the one you find at the groceries store is quite “aged” 😂 so… watch out for the sprout 😂! I will! E visto che anche voi siete Italiani … Evviva l’Italia ! Then we are not alone 😉 !